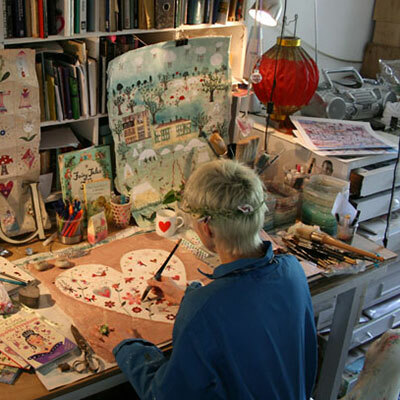 Lucy Loveheart is an international artist, illustrator and designer has produced a wonderful range of paintings, prints, children’s books, giftware and fabrics, many of which have since become collectors items. She has studied at Norwich School of Art and then went on to do a postgraduate at Royal College of Art in London. Lucy specialises in creating unique magical pictures with a naïve and childlike charm. She is inspired by the world of make believe, magical childhood experiences and daydreams. In her pictures she incorporates themes such as enchanted gardens and woods, flying, ethereal beings and animals. “I hope children looking at my illustrations will be encouraged to use their own imagination in playing, dancing or in artwork”.